Experts say that climbing stairs is one of the best cardio exercises that you can do for cardio. If you’re using stairs in a public area, you may not be able to get the best workout though, due to the quality of the stairs, the number of people in the area, or the fact that the building management gets annoyed when you run up and down their stairs too much. A vertical climber provides a very similar type of exercise in the safety and comfort of your own home. If you’re not familiar with the vertical climbers, you’ve come to the right place. 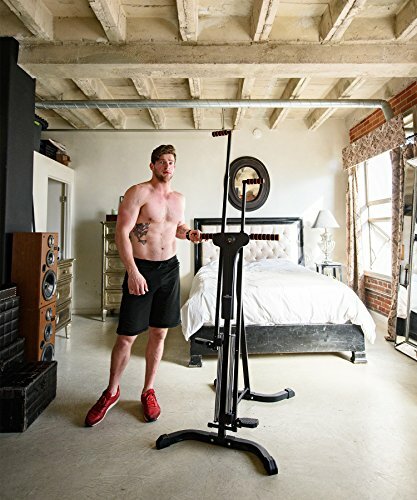 We’re going to take a close look at what they are, what you can do with them and what you should look for if you decide to purchase one for your home gym. 1 What is a Vertical Climber? 2 What Muscle Groups Does a Vertical Climber Workout? 3 What Are the Benefits of Using a Vertical Climber? 4 What Sort of Results Can You Expect When Using a Vertical Climber? 5 What Sort of Workouts Can You Do on a Vertical Climber? 6 What Should You Look For When Purchasing a Vertical Climber? Vertical climbers might sound like something designed for rock climbers, but they’re actually a very versatile piece of exercise equipment that can give you a comprehensive cardio workout without taking up too much space or breaking the bank. The design of the climber is simple – you’ve got two foot pedals to stand on, two handles to hold, and the stability feet that keep your climber from falling over while you’re exercising. They usually don’t have a ton of extras – no calorie trackers or timers attached to the equipment – but that doesn’t detract from what this equipment can do. What Muscle Groups Does a Vertical Climber Workout? The movement mimics the sort of exercise that you would get while climbing a rock wall, without the risk of falling. As a result, you end up using the same sort of muscles that you would use while scaling a rock face. With one single piece of equipment and one simple motion, you can get an intense, thorough workout that also raises your heart rate which is essential for cardiovascular health. What Are the Benefits of Using a Vertical Climber? High calorie burn – This climber is sure to get your heart rate up, and most advertise that they can burn twice as many calories as spending the same amount of time on the treadmill. Full Body Workout – You can tone and shape most of your major muscle groups with a regular workout on a climber. Low Impact Exercise – Your feet never hit the ground when exercising on your climber, making it ideal for anyone with joint injuries or individuals who just prefer a low impact workout. More Bang for Your Buck – If you’ve only got 15 minutes to exercise before work, would you rather spend that time plodding along on the treadmill, or burning twice as many calories on the climber? Good for All Fitness Levels – Whether you’re just beginning your weight loss journey or have already scaled Mt. Everest, the vertical climber is good for people of all fitness levels. Cost Effective – For the number of muscle groups you can work with just one exercise, the vertical climber is very cost effective. Space Saver – Vertical climbers take up very little space, and many can even be folded up for storage or to just get them out of the way when you’re not using them. Easy to Assemble – Vertical climbers come mostly assembled so it only takes a few minutes to get them ready to use. What Sort of Results Can You Expect When Using a Vertical Climber? This is a bit of a loaded question. What sort of results can you expect from any sort of workout? It depends on your fitness level and the amount of time you spend exercising every week. In general, though, you can expect a full body toning workout, as well as an impressive cardio workout, all from one machine. Plus, you don’t need to spend hours on your climber to get results – you can start seeing results with short workouts multiple times per week. What Sort of Workouts Can You Do on a Vertical Climber? When it comes to exercises, vertical climbers are a bit of a one trick pony. That isn’t a bad thing though – you are working the majority of your major muscle groups by climbing, so you don’t need a great variety of different exercises. What Should You Look For When Purchasing a Vertical Climber? There are a host of different vertical climbers on the market, so it can be difficult to know where to start. Footprint and Head Clearance – How much space does the climber take up, and how much vertical clearance do you need to safely use the equipment without bonking your head into the ceiling? The latter will also depend on how tall you are, but in general if you’ve got at least 8 feet of clearance between your floor and ceiling, you’ve got enough room to work out on a vertical climber. Stability – Does the climber have a wide enough footprint to remain stable on the floor while you’re working out? Maximum Weight – How much weight can the climber handle? Make sure you purchase a climber that can safely handle your body weight to prevent equipment failure or accidents. Crafting Materials – What is the frame made out of? Some models use heavy duty cold rolled steel, while others may choose to build their climbers out of lighter weight aluminium. Resistance Options – Does the climber allow for the band resistance to be adjusted to create a harder workout? Features – Does the climber come equipped with a workout timer, calorie tracker, or other additional options? Add-Ons – Are there any addons that can be included with your climber to increase its versatility? This could be anything from workout timers to cup or cellphone holders to increase convenience. Price – Vertical climbers tend to be one of the most cost effective pieces of equipment in your home gym, but you do get what you pay for. Thankfully, these climbers also tend to be reasonably priced, no matter what type of climber you get, so you can add them to your home gym without breaking the bank. And now on to the part we know you’ve all been waiting for – the reviews! Now that you know what to look for in a vertical climber, let’s take a closer look at some of the best climbers on the market and what sets them apart from the crowd. It might not have a lot of extra bells and whistles, but that doesn’t detract from the quality of the MaxiClimber – or the quality of the workout you can get from this climber. The MaxiClimber is made from lightweight but incredibly durable cold rolled steel and can support user weight of up to 240 pounds. The upper handles are adjustable, making it comfortable for a variety of heights, but it doesn’t have any sort of resistance adjustment, so it will be up to you to add extra weight to yourself (i.e. a weight vest or ankle weights, for example) if the workout starts to get too easy. 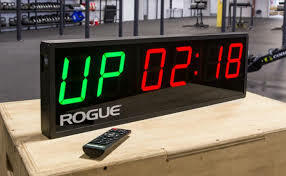 It does come equipped with a step tracker and workout timer that automatically starts and stops, making it easier to keep track of your progress, but it is a bit awkwardly placed making it hard to micromanage your workout. You have to lean back to see the counter while you’re on the machine, which can make it unstable and prone to tipping. 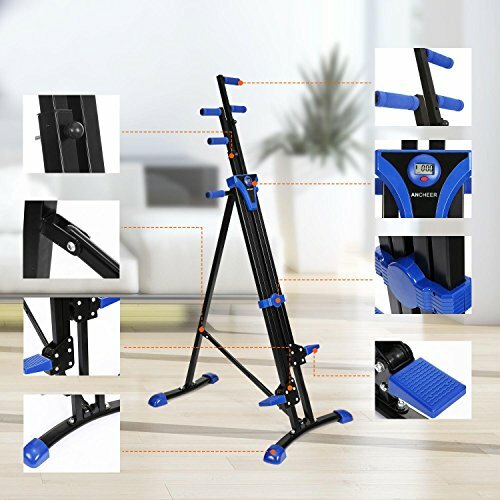 This is probably one of the best choices for someone who doesn’t have a lot of space for exercise equipment – it’s got a very small footprint and can be folded up and stashed in a closet or under a bed when not in use. Maxi has also produced a companion app for their climber, which is chock full of workout ideas, meal plans and fitness trackers, so if you like keeping your workout digital, this is a great option. Note: The climber itself does not sync to the app, it is purely for information and manual tracking. Assembly is simple – the climber comes 90% assembled, so you can be assembled and ready to start climbing within a few minutes! 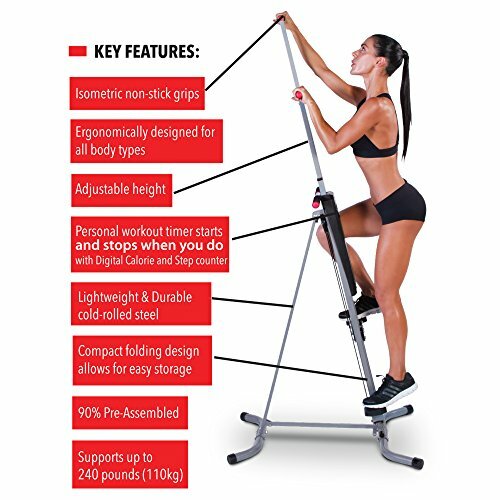 The Conquer Vertical Climber is a great budget option for anyone who’s looking to add some exercise equipment to their home without breaking the bank. The maximum weight limit for this climber is only 220 pounds though, so make sure you keep that in mind before ordering. The climber itself is made of steel, making it strong but lightweight enough for easy movement or storage. Unlike some of the other models on this list, the foot pedals are hooked to individual chains to assist their movement, making them more durable. The chains can be lubricated with any bicycle chain treatment, making them easy to care for in the long run. There is no step tracker on this model, so the manufacturer recommends pairing this with a wearable fitness tracker to record your progress. The handle height is adjustable, making it ideal for users of any height. Like most other climbers, it comes mostly assembled and the necessary assembly tool is included in the package so you can get it set up and ready to use quickly. The Conquer Vertical Climber also collapses for easy storage, so you can fold it up and stick it in a corner or a closet when you’re not using it. At 35 pounds, it’s stable enough for your workout while still being easy to move out of the way. 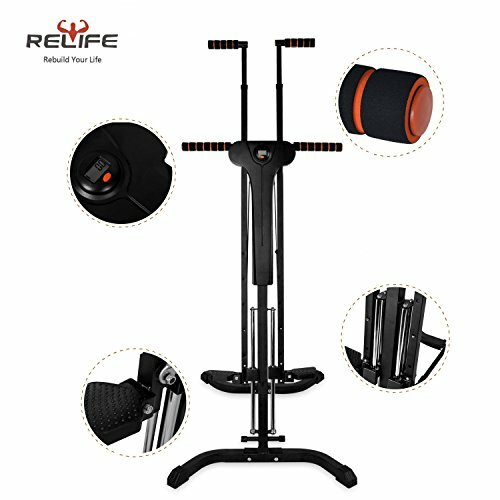 With a maximum weight limit of 250 pounds, the Relife Sports Vertical Climber is a great choice for just about anyone. While it is heavier than some of the other climbers on our list, coming at 43 pounds fully assembled, this climber comes with all the bells and whistles, making a little bit of extra weight worth it. This particular climber is the first on our list with adjustable resistance levels – you can choose one of five levels, allowing you to adapt the workout to your current fitness levels. It’s also equipped with an LCD step monitor and workout timer that keeps track of workout time, steps, speed and calories burned. Assembly is simple and only takes 10 to 15 minutes with the included assembly tool, and the fully assembled climber can be folded up and pushed out of the way when not in use. It’s a great budget option, falling solidly in the middle of the pack in terms of cost without sacrificing value or workout efficiency. The steps themselves are pulley driven, and can get a little sticky but it’s nothing that a little bit of lubricant won’t solve. It’s a bit shorter than some of the other climbers on our list, which is ideal for users who are working out in areas with low ceilings. If your current weight exceeds the maximum weight limit of the previously listed climbers, the Cosway may be the best option for you. With a steel alloy frame and a maximum weight limit of 350 pounds, this climber is built to last. It also comes equipped with a LCD screen for tracking your workout times, speed, distance, and calories burned. This climber comes fully assembled, so it’s ready to use as soon as you pull it out of the box, and can be broken down and stashed in a corner for easy storage. If you prefer your exercise equipment to match your interior decor, you’re in luck – this climber comes in black, blue, orange, and pink! 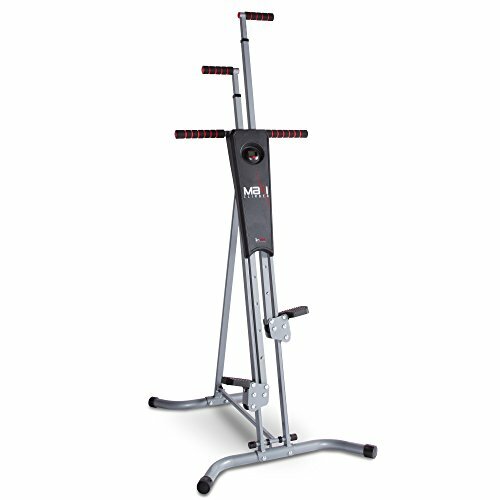 This climber does not have adjustable resistance levels, but it’s still a great option for users of all fitness levels. It is one of the heaviest machines on our list, coming in at 55 pounds when fully assembled, but that just gives it added stability which is always a bonus. Vertical climbers are ideal for any fitness level and provide a full body workout a very small space, making them perfect for anyone who doesn’t have a ton of space to fill with exercise equipment. It’s also one of the most cost effective pieces of equipment that you can buy – it’s very budget friendly with most models costing less than $200 – while still giving you a full body workout. Take the time to do your research before you decide on the best vertical climber for you. If you find a high quality climber that fits your needs, you’ll be set for muscle toning and cardio exercise for years to come.